Summit junior attacker Laurel Bonner (10) elbows through Battle Mountain defenders for a shot during the second half of a home lacrosse game on April 26. The Lady Tigers lost, 5-16. FRISCO — The final 10 minutes were the most painful. That’s when the Battle Mountain girls lacrosse team started really pulling away from Summit on another schizophrenic April afternoon, scoring four leisurely points in snow and sun while the home team struggled just to hang onto to the ball for breakaways, passing attacks and everything in between. Those last four points capped off a painful defeat for the Lady Tigers on Wednesday, 5-16, sealing the team’s first and only loss to bitter rivals. Summit is now 6-5 overall and 6-5 in the 4A Western league. Battle Mountain improves to 5-3 overall and 1-1 in the 5A Mountain league. This time around wasn’t close at all. Granted, Summit and Battle Mountain were both coming off motivation-killing spring breaks — oh, did we mention prom is also this weekend? — but the Huskies attackers and defenders looked like they hadn’t missed a beat when lounging on the beach in Mexico, or wherever they went. They split scoring between a whopping six players, including a hat trick for junior Marti Schimdt and four points for senior Chloe Doctor. 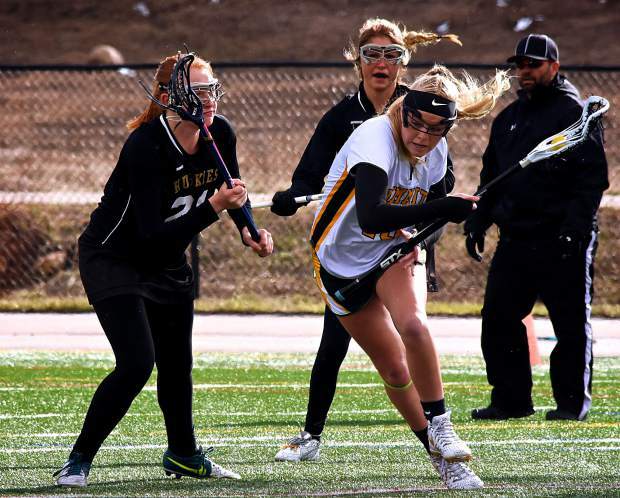 The Lady Tigers, who looked so promising early this season with a 4-1 opening record in March, haven’t won since squeaking past Conifer, 9-8, on April 10 (score unavailable for Golden on April 25). It’s the exact opposite of the boys team, which started painfully uneven and is now making a late-season run for the 4A state post-season. But enough about the boys. The Summit girls still have three games remaining, including Senior Night against Rangeview at home today (April 27, score N/A) and two away games to finish the season: Denver North tomorrow (April 29) and Evergreen on May 2. If the Summit girls can re-discover their mojo, they’ll easily finish the season over .500 for the first time since 2011, when they went 9-6. Here’s the kicker: with a 3-0 finish and 9-5 overall record, they’ll lay claim to the best record since 2010, when the Lady Tigers set program history at 12-4. Here’s to (almost) making history. Editor’s note: This article has been updated to reflect the all-time best record of 12-4 in 2010.